Alexander Filippovich Kokorinov – a talented architect of the eighteenth century, one of the designers and the first director of the Imperial Academy of Arts in St. Petersburg. The artist Levitsky owes much to his patron Alexander Filippovich, his immense respect for his figure is reflected in this ceremonial half-portrait. 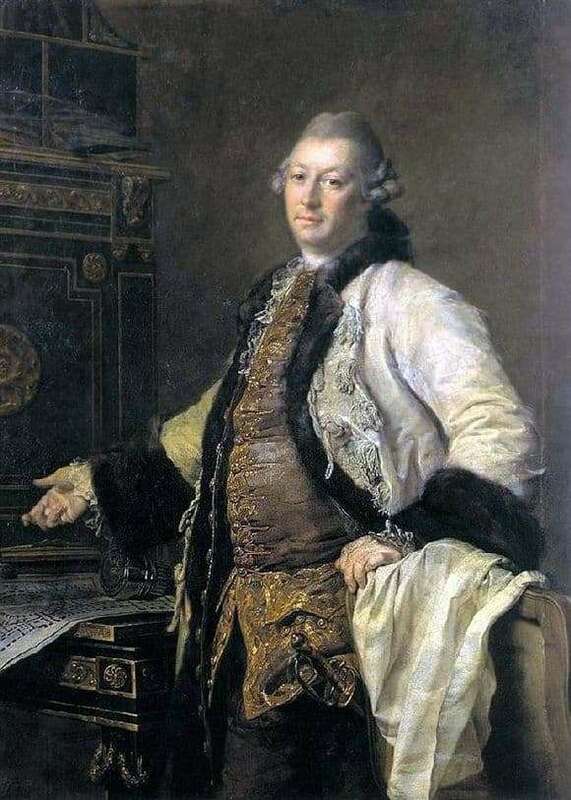 The aristocracy portrayed with taste is emphasized by Kokorinov’s stately, open pose, his beautiful clothes: here there is a satin camisole sewn with gold threads and a snow-white caftan with sable furs. With a confident gesture of the right hand, Kokorinov points to his blueprints of the building of the Imperial Academy. Being in his spacious office, Kokorinov feels proud of the work he has done, his “master’s pose” speaks about it – leaning over the back of the carved chair, he is happy to show the artist his “possessions”. The portrait’s view, however, cannot be called proud, Kokorinov looks at the viewer with amusement, his eyes are warm and tired, one can feel the significance of the work done by him. A sword and a powdered wig are indisputable attributes of an aristocrat like Alexander Filippovich. Of course, on the face of the director of the Academy of Arts there are no signs of anxiety, foreboding of the upcoming discord in his beloved field. There is nothing that would signal a storm looming on the fate of the architect. As you know, several years after the architect took the post, his life changed drastically, the persecution arranged by his “competitors” would break this big and strong man, make him commit suicide. The strength of Levitsky’s portrait gives the impression of a man firmly heading toward his goal, with a warm twinkle in his soul. The skill of Dmitry Levitsky creates an accurate psychological portrait of a great architect.